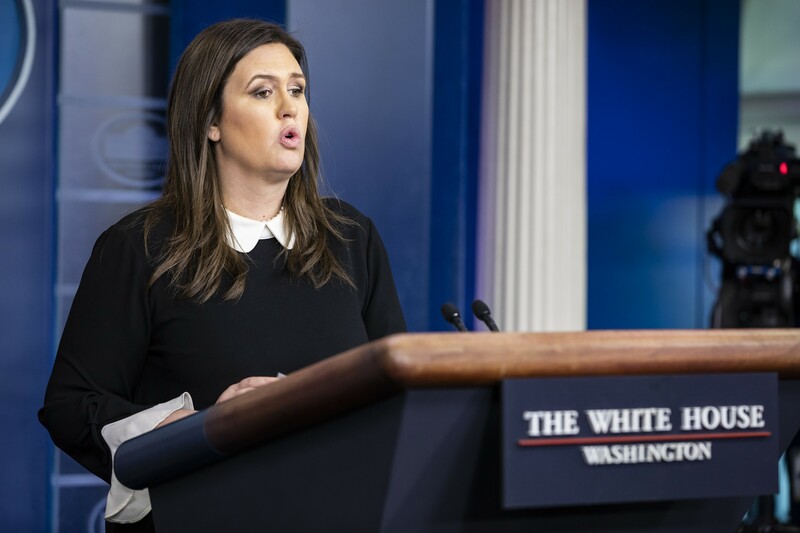 Press Secretary Sarah Huckabee Sanders answers questions during a briefing at the White House in Washington, Dec. 18, 2018. The White House signaled on Tuesday that President Donald Trump may be backing down on his demand for $5 billion from Congress for a wall on the border with Mexico, easing fears of a Christmas government shutdown that would begin at midnight Friday. WASHINGTON — The White House signaled Tuesday that President Donald Trump might be ready to capitulate on his demand for $5 billion for a wall on the southwestern border, but negotiations on a spending deal remained stalled as lawmakers awaited a White House strategy to avert a Christmastime government shutdown. Days before midnight Friday, when funding for large parts of the government will lapse, the White House blamed the Republican-controlled Senate for failing to pass legislation to bridge the divide, while Republican leaders said they were still unsure what the president was willing to sign. Minutes later, Sen. Mitch McConnell, R-Ky., the Senate majority leader, told reporters at the Capitol that he was still trying to determine what Trump would accept. Republicans worked to create a package that would allow Trump to declare victory in retreat, but they came up empty. Instead, senior congressional aides in both parties said an agreement was close at hand to essentially push the government spending fight into the new year, when Democrats will assume control of the House. Sen. Chuck Schumer of New York, the Democratic leader, said his party would be open to the idea. Sanders offered the first glimmers of a way out of the impasse in an interview Tuesday morning on Fox News, in which she said Trump — who only a week ago said he would be proud to force a shutdown over wall funding — did not want to see government funding lapse.